The foreign ministers of Russia and Japan met in Moscow on Monday pushing ahead with efforts to strike a peace deal and end a decades-old dispute over four strategic islands. 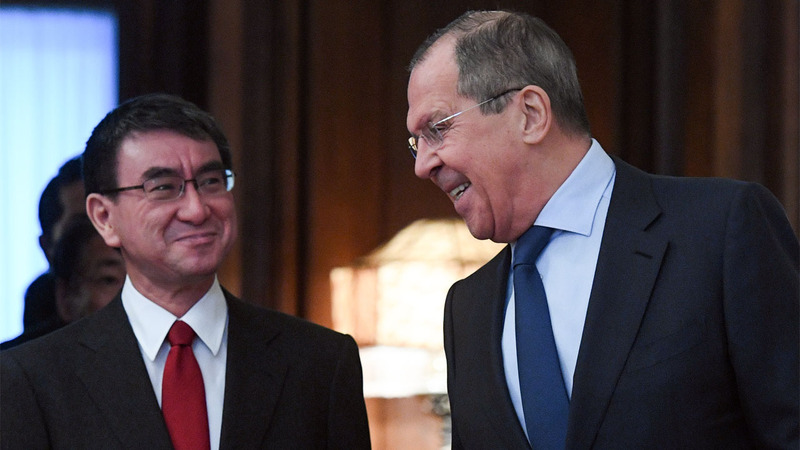 Meeting his Japanese counterpart Taro Kono, Russian Foreign Minister Sergei Lavrov said the resources for cooperation were “truly inexhaustible” and should be used to work towards a peace agreement. Japan and Russia have never signed a treaty ending World War II. The USSR invaded the far-eastern Kuril chain in the final days of the war and Japan refuses to give up its claim to them although the United Nations formally recognises them as Russian territory. “It’s a difficult issue, we have to deal with the legacy of World War II, whose outcomes have been codified in the UN charter and Allied documents,” Lavrov said. In November, Russian President Vladimir Putin and Japanese Prime Minister Shinzo Abe agreed to accelerate talks on a peace agreement which would build on a 1956 Japan-USSR declaration which restored diplomatic ties. The joint declaration said that the USSR agreed to hand over two of the islands — Habomai and Shikotan — to Japan following a peace deal. Japan however demanded sovereignty over all the disputed islands, which include Iturup and Kunashir and peace talks stalled. In remarks before the Monday meeting, Japan’s Kono said the two countries must use the great potential for cooperation. He said, in remarks translated into Russian, that they should “speed up (peace) negotiations, going beyond the boundaries of previous positions,” without elaborating. The Kuril islands had been neglected by Moscow for decades, however in recent years it increased its military presence there, to a furious reaction from Japan. Ceding any islands to Japan is unlikely to go down well in Russia, where a wave of patriotic sentiment has been whipped up by the Kremlin since 2014, when Moscow annexed the Crimea peninsula from Ukraine. The governor of the Russian island of Sakhalin, who also administers the Kurils, last week said locals oppose territorial changes. Hundreds protested recently against any handover. “The Kuril islands are Russian soil, that is clear. The issue of handing over the Kuril islands is not on the agenda,” governor Valery Limarenko told Gazeta.Ru news website.